Series of 7 ink/pencil drawings on paper, 19.5 cm x 13.5 cm. 2018. 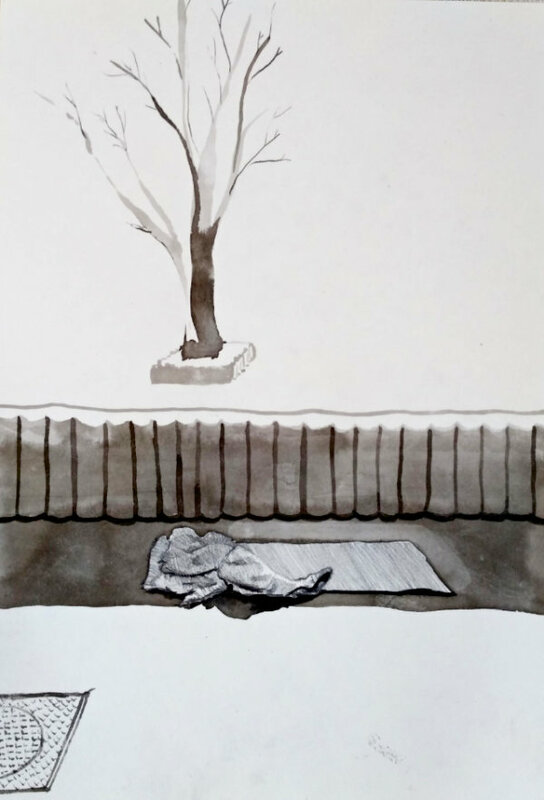 With this ink/pencil series of seven pieces I would like to reflect on a new Hungarian law against homeless people, enacted on 15 October 2018. Under the new rule, homelessness is forbidden, meaning that one cannot live on the streets permanently. Those, who break the rule, can be sentenced to community service or even be imprisoned. Authorities are permitted to destroy the belongings of the homeless, for which the state does not have to compensate them. With this series I wanted to emphasize the government's denial of homeless people, and the law's absurdity and sadness.